I suppose I should start with a pithy aphorism about the cobbler's children or a busman's holiday, but the truth is I'm just too damn lazy (have ya noticed how often I refresh the calendar page?). I literally cannot remember the date of this gig. I had just gotten the B4 organ emulation software from Native Instruments, and I realized I could actually realistically play organ trio gigs without destroying my back (the uninitiated among you may not know that a Hammond B3 organ with bench and pedalboard weighs 425 pounds). So I built a two-manual MIDI controller in a stained wood case that superficially resembled a Hammond - but that could be carried under one arm, oh frabjuous day. I'm pretty sure this was the first gig I played with this setup. Non-geeks may now want to move to the next paragraph. 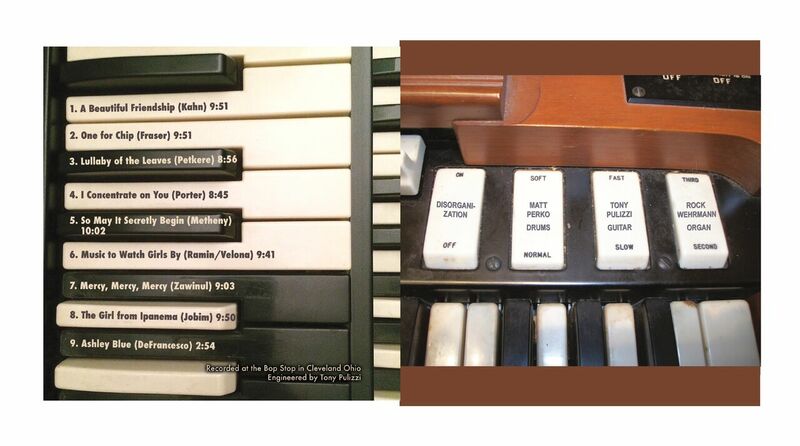 There were two no-frills 61-note MIDI keyboards carefully mounted in the same relative dimensions as the Hammond manuals. I had a snazzy little footswitch setup where I could kick the software Leslie into off, chorale and tremolo modes and a single set of drawbars from Voce, I think. I used it, a Mac laptop and a Fender Passport PA system in stereo (stereo's crucial for the Leslie simulation). I actually have a set of Hammond pedals converted to MIDI, but they weigh more than the rest of the entire system, so I wisely decided to kick left-hand bass. As I said somewhere else on this site, it is the wise man indeed who surrounds himself with younger and better players, so I got Matt Perko on drums and Tony Pulizzi on guitar. If you listened, you already know how good they are. Matt is in Santa Barbara nowadays making a name for himself as a photographer and making us all look bad with the ease with which he masters new disciplines one by one. Tony's in LA, playing sessions and touring with the rich and famous (that was him on several seasons of American Idol). Tony had just gotten a Roland hard-disk recorder and wanted to try it out, so he just threw up some mics and hit "record". He took a direct feed from the computer, and the rest is social studies. No rehearsal and no charts (except on "Ipanema", which was my reharmonization). Probably no more than 40 people in the place, but we didn't care - we had a ball. So, you get this, right? • The tunes are not in performance order. I think we opened with "Ashley Blue", and it all went pear-shaped from there. The blur at the end of "Ashley Blue" was the dreaded MIDI lock. What have we learned? Use a faster laptop. • The D above middle C on the upper manual has a skeevy contact, so that's the reason for holes in the lines. Yeah. That's the reason. • I was just SO clever at the end of "Music to Watch Girls By", putting the rest on 1 that nobody could possibly have predicted and not cueing it very well and causing the other guys to step in a hole, wasn't I? • Many thanks to Carol Morra for her deliquescent layout work. I worked in advertising for many years, and a quote about doctors being the worst patients comes to mind. Thanks for putting up with everything, darlin'. • What's better than roses on a piano? This didn't make the cut due to timing restrictions and because it's the, um, least wonderful thing we played.